The dining room at Vineyard Café and Coffee. Bright red chairs around small tables draped in grapevine tablecloths are scattered around the room. A few people holding coffees settle into a couch facing a bright mural of shops along an Italian road. What was once a warehouse is now the quaint, Tuscan-themed Vineyard Cafe and Coffee, located just east of downtown Spokane. Lynda Morrison with Healing Rooms Ministries, which oversees the cafe, describes the idea behind opening the café as an opportunity to bring the community together. "Our little area is overlooked in a lot of ways, and many of the neighbors have been here for years and don't necessarily know each other," says Morrison. 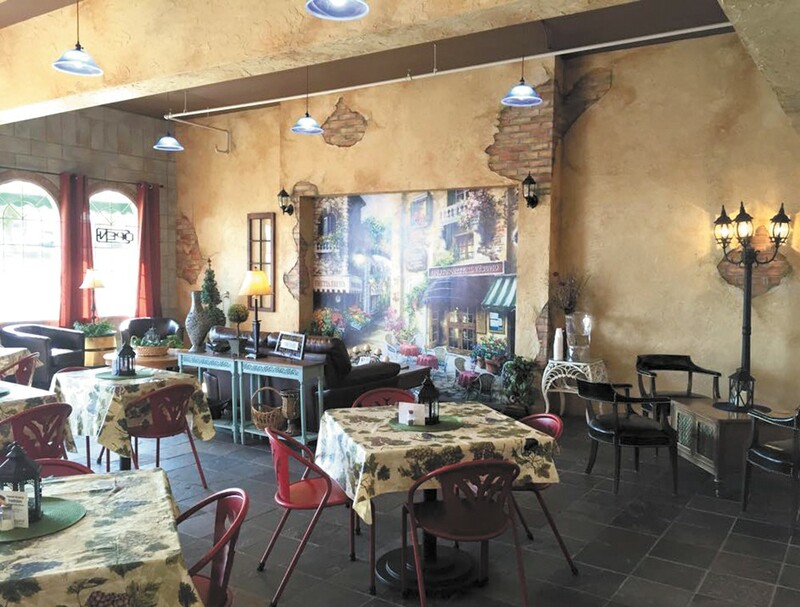 Though the room of the café itself was already Tuscan-themed, manager Robyn Tash focused on all of the tiny details and personally refinished the furniture. "Robyn is really the heart behind Vineyard Cafe and Coffee. She created the menu and all of the furnishings," explains Morrison. Vineyard Cafe and Coffee has been open since February; its patio has provided customers with a space to enjoy a little sunshine with their meals in these summer months. Each table is decorated with a flowerpot and features an umbrella for shade. Morrison hopes that people will come and enjoy the atmosphere they have created that is different from other cafés around town. They serve coffee, espresso, breakfast sandwiches on croissants and bagels and an assortment of grilled and cold sandwiches, soups, salads and scones. Specials include freshly baked scones of the day, beverages such as mango green tea and sandwich meals that include salad, soup or chips. With many people visiting the Healing Rooms every day, Morrison is happy that they can now provide visitors with an opportunity to have a good meal while they're there.